These days, people spend a lot of time in their cars, whether we’re commuting to work, going out to eat, traveling to that hot vacation spot down south—the list goes on and on. Try as we might, there’s practically no way to keep the interior from getting dirty over time. Soft drinks get spilled, dirt accumulates on the carpets, weird smudges keep appearing on the insides of the windows. The car eventually starts looking like a disaster area. Luckily, the interior car detailing pros at Cobblestone Auto Spa can make your vehicle look like it just rolled off the lot. 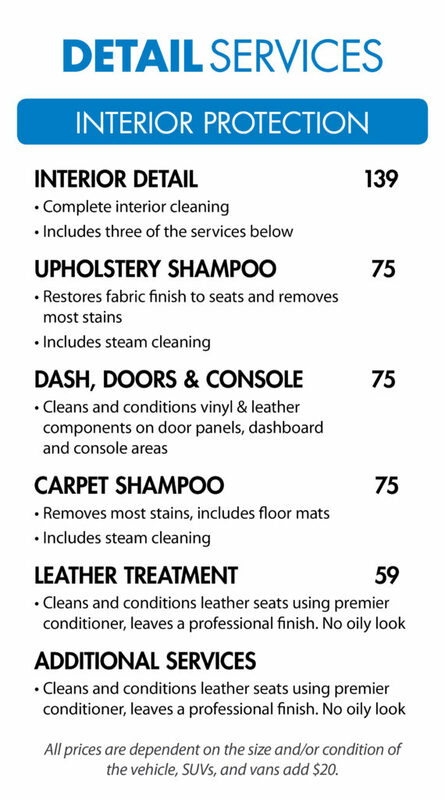 We provide a complete interior detail service that covers pretty much everything inside your vehicle, like leather treatment as well as carpet and upholstery shampoo. Our other car interior detailing services include fabric protection, air conditioner treatment, and dash, doors, & console cleaning. Aside from cars, we clean boats, RVs, and motorcycles—we’ll give you a quote for these services upon request. With multiple locations throughout Arizona—you can find us in Tempe, Chandler, and Phoenix, among other towns—it’s easy to find a Cobblestone Auto Spa near you. So what are you waiting for? *All Detail Pricing is subject to size and condition of vehicle.